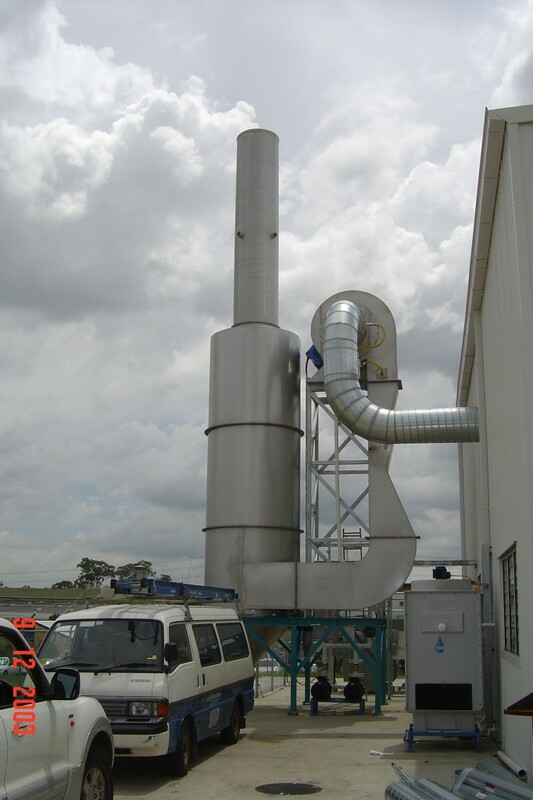 The principle of wet scrubbing systems as a means of fume and dust extraction has been implemented for many years. 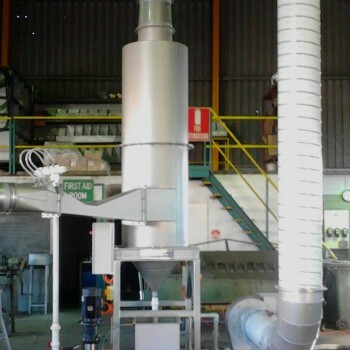 Generally, it has been accepted that the collection efficiency in wet scrubber units is dependent on the energy applied to the particles by the scrubber action. For best efficiency, DCS uses a down flow venturi principle to promote turbulent contact and mixing of the water with the dust/fume particles. 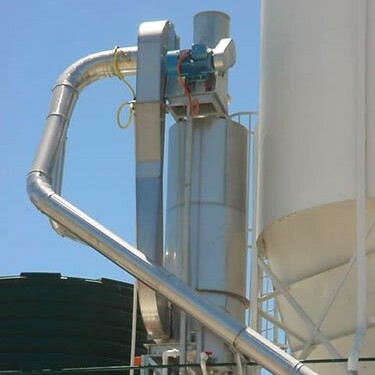 Dust Collection Services has worked long and hard to refine the design to achieve a high level of efficiency using wetting agents when necessary and a special spray nozzle design. 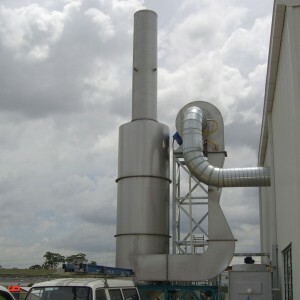 At DCS, we have a range of dust collection industry solutions available, including the Modu-Pulse Series Dust Collectors. There are several designs used from high velocity wetted venturi to direct impingement and packed towers and we can offer you the right design for your particular application. Dust/fume laden air enters the fan (A) where a fine spray jet directs water onto the fan impeller. This creates a turbulent mixing of the fume/dust with the water particles. 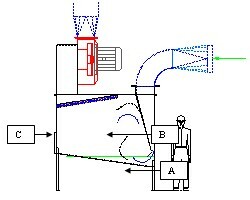 The air/water mix is then accelerated through a venturi (B) section where the water/fume mix is accelerated and additional sprays introduce more water. The effect of the venturi is to create turbulent contact with the particles and to momentarily vaporise the water and increase the surface contact with the pollutant. The expansion after the venturi restores the static pressure and directs the water to the separation chamber (C), where the water absorbed fume/dust is deposited into the settling chamber (D). Concentrations of liquor are drained periodically via a diaphragm valve (E). Water level is maintained by a sensor and solenoid valve from the water supply feeding into the top of the settling chamber. The DCS compact series wet scrubbers are ideal where a medium to high efficiency scrubber is required with limited floor space. They are ideal for powder coating, soluble fumes, most acids or alkaline fumes or dusts, laser cutting processes, and a wide range of other applications. The compact scrubber uses a high velocity venturi (A) to create turbulent contact between the fumes/dust and the water. The water is then cascaded with curved baffles (B) so that the air has to pass through two water curtains before exiting through a mist elim inator (C). 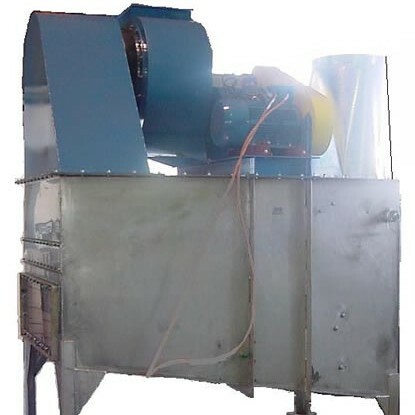 To keep the unit compact, the fan is direct coupled to the motor and mounted on top of the unit. The scrubber is manufactured in a range of sizes from 2,400 up to 140,000 m3/hr with fans arranged to suit the system resistance required for your application. 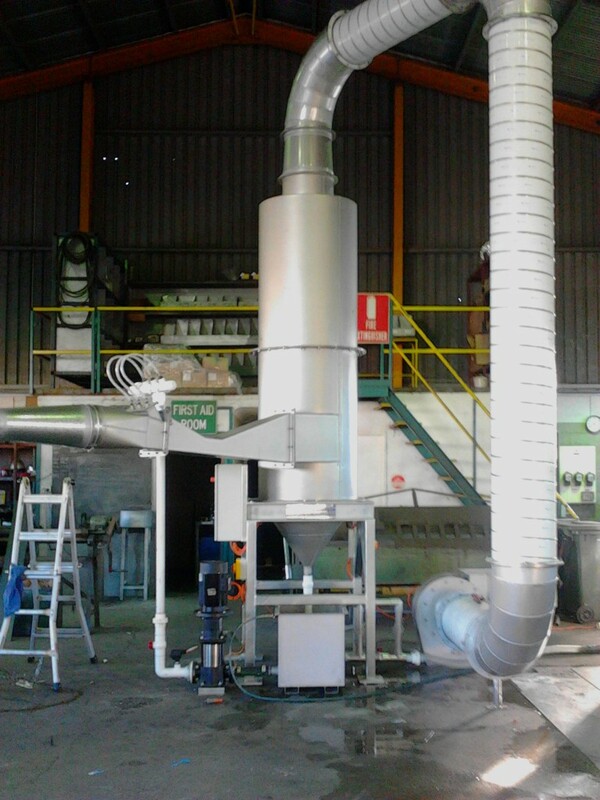 Effective environmental systems require a well-designed ducting system and catchment hoods to achieve the best result, and DCS can design, manufacture and install turnkey extraction systems that will meet your requirements.